Mine Wars Guide - Player Submitted Guide to Mine Wars - Game Guides - Koramgame.com - Free Browser Games and Social Games - Powered by Discuz! Every summer at 8:00-9:00pm server time, mine wars will be held. Every one must join this to earn a lot of silver. The higher city hall you upgrade, the more silver you extract from mine. Which do i belong to? enemies attacked you but fail. You will be booted to back to your camp if you reach a certain amount of victories. Extract CD - It show how much time left for the next extraction. Action CD - It show how much time left for the next action. Move from one mine to another mine in 15s cooldown. Extraction have 4 mins cooldown. The 2x mine appears on random mines which give you double the Silver! lose only 30s to your extraction. If enemy successfully attack you, you will be booted back to camp. 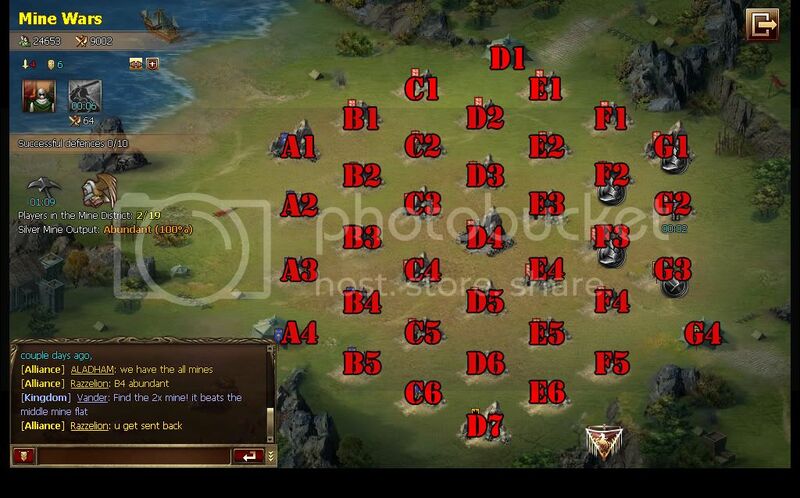 If enemy fight and lose you will get 1 successful defences. Recruit = Can refill your reserve. [Private] Successfully defensed 10 times, you are sent back to base camp. Before the mine wars start, draft to make your reserves full. Buy some grains on the black market when the price is 0.5. As the mine wars start. Rush to the front line mine.There is no point camping at the back. Remember you have 4min harvest cd and the only way to reduce it is to attack other kingdom mine. Watch closely your harvest and move cd. When your movecd is below 30s. There is no point attacking just attack after you harvest. Check if the mine is crowded. Move to a mine that is abundant or normal. If your kingdom is winning just maintain the borders. Dont occupy all the mines in the map because it will cause the other 2 kingdom ally. Say yourcoordinates and if you are booted back to camp, shout to the kingdom chat whobooted you and what is his location. If you can see x2 output mine. Just move to the minewhen you are about to harvest. Dont camp at that mine because many bully cardwill be thrown to you. Conclusion: Team work is the key for success. how if there is no icon right side below the event icon? how we could join the mine war? 19-4-2019 17:56 GMT-7 , Processed in 0.014981 second(s), 9 queries .